Photographer: Jeff Bark. Model(s): Catherine McNeil. Source: Numéro Magazine. Stylist: Charles Varenne. Makeup: Marla Belt. Hair: Rick Grandone. 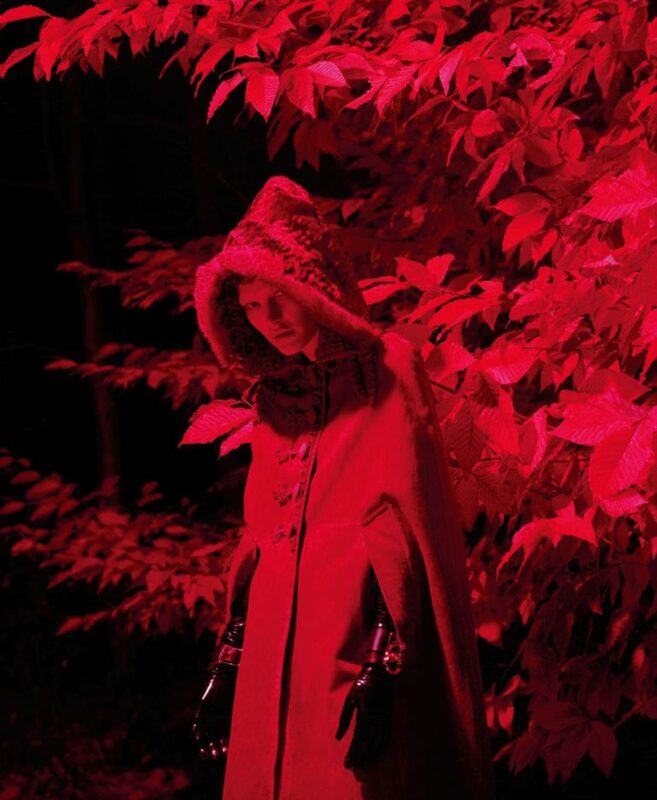 Catherine McNeil plays her part dark in ‘Maléfice’ by Jeff Bark for Numéro #179. The heart builds as the music swells leaving the sorcery of enchantment to cast its spell. Our heroine finds herself lost in a world of mystic overlay, as we are awakened by the mischievous spirits of Maleficence. Inspired by the surroundings, Bark’s powers reach from the great beyond. 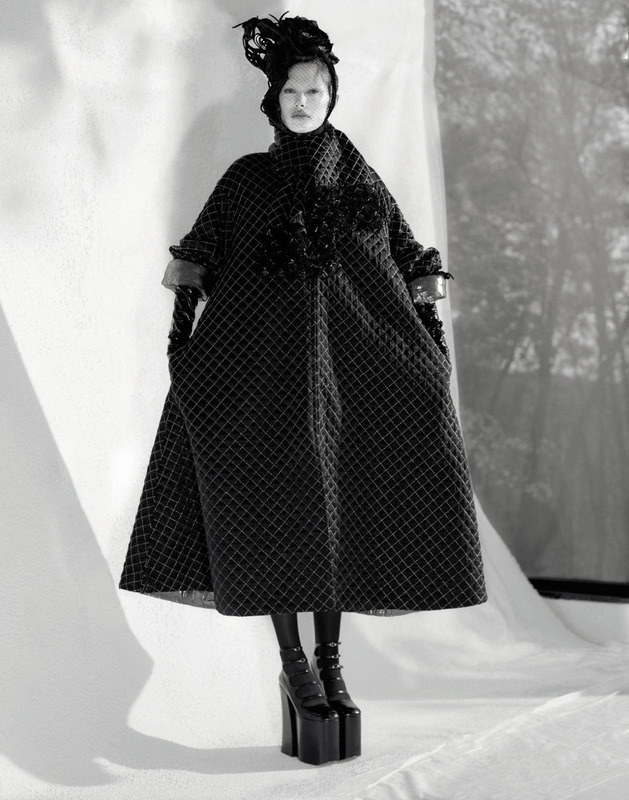 High fashion redefines the ideal of noir with black that revels in the unknown. Charles Varenne brings magic to life by capturing the art of wickedly, wonderful looks. Catherine appears like a creature from another dimension, in head-to-toe black, she’s encircled by a neck-line of feathers. Twisted decadence defines the day as creative couture leads the way. Dressed in a long coat and flooded in a red light, she resembles Little Red Ridinghood, but upon closer examination we see she’s the fox. The maestro of makeup has arrived as Marla Belt makes us believe in magic. Taking an animalistic approach, Belt brings ferocity to the page with a face that looks like a character from a fairy tale. No brows give the forehead a strange shape with strong features that follow suit. While lined eyes draw you inside, with wings that pull you out from the lid line. Following the bewitching theme, her skin appears totally white, giving an otherworldly edge. Her mouth is made to look like she’s just taken a succulent bite, as her deep Bordeaux lip shade appears done with a wild hand. Hiding in the night the red light arrives – turning everything dreary into a decadent delight. Standing in silence with a golden spider clenched between her teeth, she looks somewhat crazed as her dilated pupils give her away. A disc like cap circles above her head with netting that falls over the eyes. Rick Gradone embraces the thrilling theme with haute hats that bring the story to life. Sculpted coiffure captures our imagination as sinuous shapes sit on the head with mystical majesty. Celebrating the theatre of display this tale is at once eerie & exotic. Defined by environment, this piece punctures through our precious notions by presenting a compelling dose of drama. Working within the bounds of nature, Bark allows each scene to find a sense of purpose. Beautifully dilapidated architecture gives rise to the idea of an end-of-the-world scenario. Magic seems to walk the line of Maléfice in a place where power can reach from way beyond.